First, we introduced an easy way to organize, manage, and collaborate on projects – through OneDesk’s projects. As OneDesk’s mission is to make your job easier, we have taken projects to the next level: Release management and product roadmapping. OneDesk’s release management capabilities allows you to structure your projects and create sub-projects. Having subspaces allows you to organize products, target releases, projects, and teams. This makes it easy to assign requirements, ideas, issues, and features to products and releases. It also allows internal and external team members to collaborate on specific releases and projects. Learn more about these release management features. 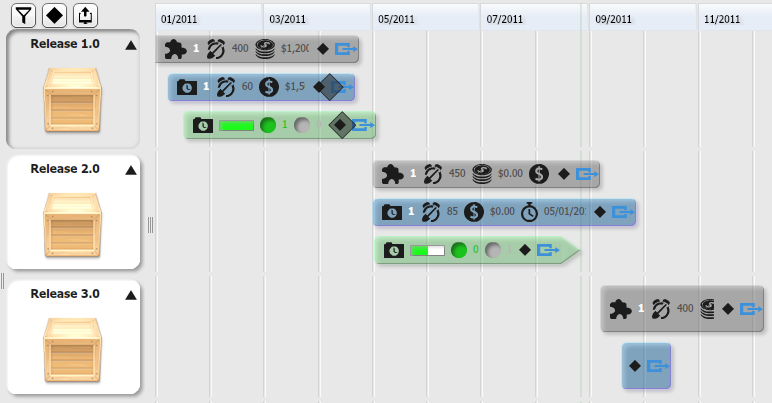 OneDesk’s roadmapping tool allows you to compare information in several projects in one view. It also allows you to visually lay out cost plans and schedules by providing more accurate analyses and estimates. This improves long and short term decision making. Simply export your roadmaps in one click, and you are ready to present plans and progress. Learn more about these product roadmapping features.